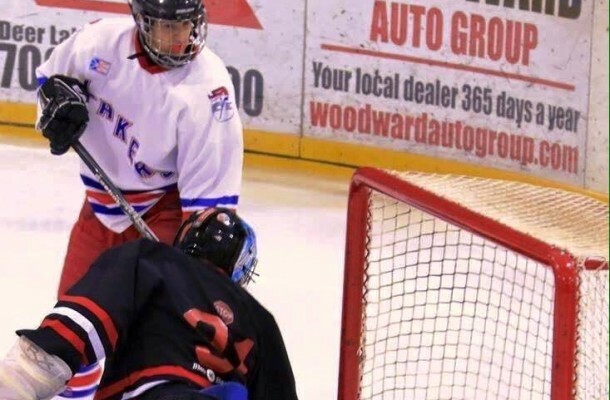 The Elwood Regional High Lakers win over the St. James Regional High Saints gave them a 2-1 semi-final series lead in the best-of-five West Coast High School Hockey League. The Lakers managed to take the series lead by winning 6-3 over the Saints on Tuesday night at the Hodder Memorial Stadium. After dropping game 1 to the Saints in a 2-1 overtime loss, the Lakers rebounded to tie the series at 1-1 with a 7-1 trouncing. In game 3 of the series, the Lakers jumped out to an early 2-0 lead. However, the Saints battled back to tie the score at 2-2 before the Lakers scored a late period goal to make it 3-2 heading into the dressing room after the first period. In the second period David Hardy of the Lakers made it 4-2, a goal that turned out to be the eventual game winner. The Saints clawed back into the game when Nick Drover scored early in the third period to make it a 4-3 game. However, the Lakers buried two more goals as Jacob Bennett and Kirklin Anstey scored insurance markers. David Hardy and Michael Maher scored a pair of goals for the victors, with Bennett and Anstey adding singles for the Lakers. Nick Drover had a pair for the Saints with a single marker coming from Noah King. Kirklin Young was in net for the Lakers with Brady Aucoin suffering the loss for the Saints. Game 4 is scheduled for Thursday, March 3 at the Bruce II Sports Centre in Port Aux Basques. The winner of this series will face off against the defending champions – the Stephenville High Spartans.